Elmasonic P60H 5.75 Liter / 1.5 Gal Benchtop Ultrasonic Cleaner 37 and 80Khz Dual Frequency, Digital Control + Timer + Heat + Degassing + Cover, Inner Tank Dimensions; 11.8" x 5.9" x 5.9, Part No:103 3240 Brand New Item. The Elmasonic P is the ideal unit for professional applications in analytical and medical laboratories and in industrial production. The unit series consists of 6 different unit sizes with tank capacities ranging from 2.75 to 28 litre. Ultrasonic cleaning with multi-frequency technology (37/80 kHz) and special features are perfect for intensive cleaning. The units are more powerful than standard ultrasonic cleaning units, and the ultrasonic power can. Be reduced electronically depending on the cleaning task. The new Elmasonic P ultrasonic series is the ideal helper for all applications in analytical and medical laboratories and in the industrial production. Six different unit sizes are available. The practical units are easy to operate with a clearly arranged display showing all set and actual parameters. Several special features make the units perfect for. Intensive cleaning applications or for laboratory jobs. Multi-frequency at 37 or 80 kHz. Standard applications are carried out at 37Khz. All units are considerably more powerful than conventional ultrasonic units. If the high energy density should prove too strong for individual cleaning jobs, it can be reduced electronically. Operating the unit at 80Khz prolongs the cleaning time and is ideal for the treatment of very small and sensitive items. Even tiny capillaries are reached by the imploding miscroscopic cavitation bubblles. A positive side effect is the comfortably low noise level at this frequency. Ultrasonic tank made of cavitation-proof stainless steel. Casing made of stainless steel, hygienic and easy to clean. Two ultrasonic frequencies, switchable in one unit: 37 kHz und 80 kHz. 37 kHz: for the removal of coarse contamination and for mixing, dissolving, dispersing and degassing. 80 kHz: perfect for the cleaning of capillaries and fort he use in quiet work areas, prolonged cleaning period. Automatic frequency switch-over for simultaneous coarse and fine cleaning. Activatable Sweep mode for an optimized sound field distribution within the cleaning bath. Activatable Pulse mode for an intensified ultrasonic cleaning power, additional ultrasonic power up to 20%. Activatable Degas mode for the quick degassing of HPLC samples or solvents and of fresh cleaning liquids. Auto Degas mode for an automatic degassing cycle, e.
Ultrasonic power variable for sensitive surfaces. Temperature-controlled ultrasonic operation: ultrasound starts automatically as soon as the preset temperature is reached. Indication of unit settings e. Set and actual values by alphanumerical display. Saving of the last unit settings at switch-off. Drain duct mounted to the unit rear, operation of the drain duct on the unit side. Automatic stirring during heating-up process. Automatic safety switch-off after 12 h operation to prevent unintended permanent operation. Automatic safety switch-off at 90 °C to protect the cleaning items against excess temperatures. 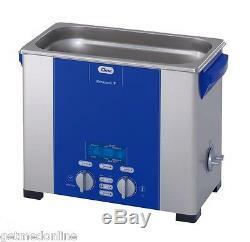 Elma Sonic P60H 1.5 Gal Ultrasonic Cleaner, Digital Control, 37 and 80Khz" is in sale since Friday, September 12, 2014. This item is in the category "Business & Industrial\Healthcare, Lab & Life Science\Lab Equipment\Cleaning Equipment". The seller is "getmedonline" and is located in Medford, New York.